China-based Ruins Kung aka Ruins Work Joins Taiwanese 13 ART aka Sullman to release a skultastic high-end figure! 13 ART is known for his weathering and dynamic skulls combined with Ruins vast knowledge of high-end figures S.D.F-13 has been unleashed to the public for the first time. 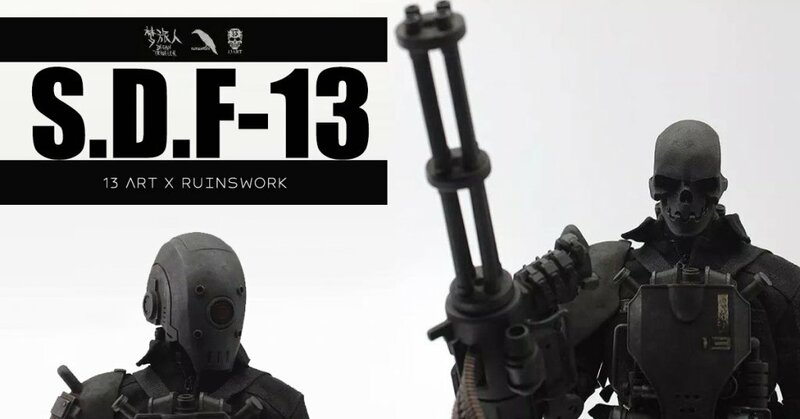 Packed with amour and enough firepower to bring an end to world wars, S.D.F-13 By 13 ART x RuinsWork is up for pre-order NOW. against the monsters, and The No.13 Army is a heavy fire infantry under S.D.F. as a matter of fact, they are the products of Dr. Mashito’s human transformation experiment. Moreover, the birth of monsters also has an inextricable relationship with Dr.